Technical Group External relationship | Alianza del Pacífico. ¿What does the GRE do? The External Relationship Group (GRE, by its acronym in Spanish) was created by mandate of the Council of Ministers of the Pacific Alliance during its 8th Meeting held in Villa de Leyva, Colombia, on June 29 and 30, 2013. 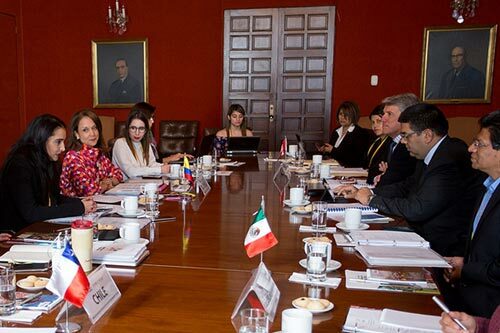 It aims to design a strategy to link the Pacific Alliance with Observer States and third parties, and generate a permanent and fruitful exchange with them, to promote the objectives of the Pacific Alliance. 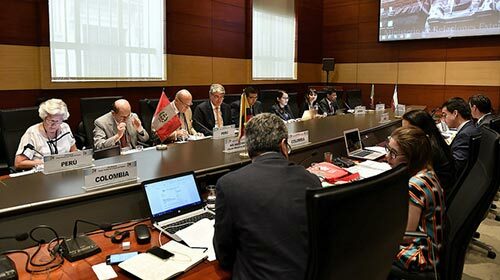 In accordance with its mandate, general guidelines have been adopted for its operation and, recently, guidelines to facilitate interaction between the Pacific Alliance and the observer States. America (14): Argentina, Canada, Costa Rica*, Ecuador, El Salvador, United States, Guatemala, Haiti, Honduras, Panama*, Paraguay, Dominican Republic, Trinidad and Tobago and Uruguay. Africa (2): Egypt and Morocco. Asia (9) R.P. China, Korea, India, Indonesia, Israel, Japan, Singapore, Thailand and United Arab Emirates. Oceania (2): Australia and New Zealand. Europe (28): Germany, Austria, Belgium, Belarus, Croatia, Denmark, Slovakia, Slovenia, Spain, Finland, France, Georgia, Greece, Hungary, Italy, Lithuania, Norway, Netherlands, Poland, Portugal, United Kingdom, Czech Republic, Romania, Serbia, Sweden, Switzerland, Turkey and Ukraine. The Alliance has the technical and financial support of the IDB, CAF and OECD in areas such as global value chains, agriculture, regulatory improvement, SMEs, promotion of exports and investment, trade facilitation, innovation, intellectual property and services and capitals. The CAF has begun to explore initiatives to develop an infrastructure fund, projects in innovation, entrepreneurship and SMEs. On September 24, 2016, the Pacific Alliance and the Association of Southeast Asian Nations (ASEAN), adopted a cooperation document between the two mechanisms with emphasis on economic, educational, sustainable development, science and technology issues. On September 22, 2017, in the framework of the 72nd General Assembly of the United Nations, the Fourth PA – ASEAN Ministerial Meeting took place, where both the PA and ASEAN ministers shared their vision on the future relationship of the growing bi-regional relations between the Pacific Alliance and ASEAN. Additionally, the Work Plan between the two mechanisms for the period 2017 – 2018 was revised. On September 26, 2018, in the framework of the 73rd General Assembly of the United Nations, the Fifth PA-ASEAN Ministerial Meeting took place. The ministers evaluated the progress and effective implementation of the Pacific Alliance-ASEAN Work Plan; besides, they agreed to extend its validity until 2019 to conclude the initiatives underway and allow the development of new activities. The leaders of the Pacific Alliance have held two meetings with the leaders of the APEC economies, the first one took place in November 2015 in the Philippines and the most recent was held during the APEC Summit in Lima in November 2016. The cooperation interest between the Alliance and APEC has focused on the development of human capital (including education), the participation of small and medium-sized enterprises in global value chains, trade facilitation and connectivity. On November 19, 2016 in Lima, Peru, the second dialogue between APEC and the PA was developed, which focused on two priority topics as opportunities development axes and in order to share experiences and best practices: the internationalization of SMEs with global projection and the facilitation of trade. The Ministers of Foreign Affairs and the Ministers responsible for Foreign Trade and Production of MERCOSUR and the Alliance agreed to work on bringing these mechanisms closer together, giving priority to issues such as trade facilitation, customs cooperation, trade promotion, support for SMEs and identification of possible regional value chains. With the European Union, the Pacific Alliance has initiated a dialogue to develop cooperation in the following areas: trade facilitation and investments; free mobility of people and ERASMUS + program. List of Observer States, pillars to which collaboration and thematic work areas are focused.